Cleveland Cavaliers LeBron James reacts during introductions before a game against the Washington Wizards at Quicken Loans Arena on Feb 22, 2018. The Sixers may have gotten a meeting with his representatives on Sunday afternoon, but it was the Los Angeles Lakers who got the last laugh. 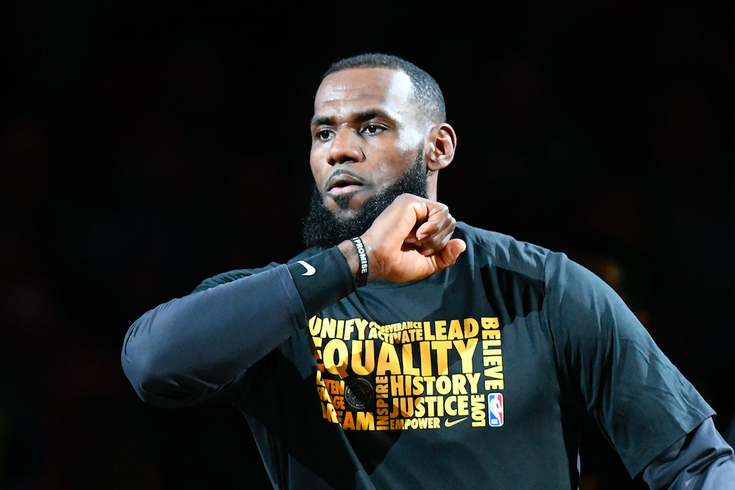 LeBron James has agreed to a four-year, $154 million contract with the California franchise, in a move that is part expected, part complete shocker. First things first: After two of the most publicized decisions in NBA history, James' decision to join up with the Lakers was a comparative whimper, coming through a press release sent out by his agency, Klutch Sports. Despite the underwhelming nature of the release, it is as real as it gets. His choice certainly calls into question what the decisionmaking flowchart looks like for James, who heads to L.A. to join a cast of unproven characters in a much tougher conference. It's probably a little overzealous to say James is done making decisions based on basketball reasons, as many (especially in Philadelphia) have been happy to do. But it's certainly true that James is heading to a situation with a lot more uncertainty than he would have seen elsewhere. It will be easier to steer another star toward the sunny shores of L.A., but there's a lot of work left to do to make it happen. With this move, the Kawhi Leonard sweepstakes take on a much bigger significance for all parties involved. The four-year commitment from James is stunning, however, and affords Magic Johnson and Co. a bit of patience they may not have had otherwise. Rather than staring down the barrel at James' free agency every summer, they can move forward with the knowledge they have him under contract through at least 2020-21, with a player option for 2021-22. Knowing what they'd be handing the Lakers in a deal should they complete it, the San Antonio Spurs have every reason to demand a ransom in order to send their star to L.A. Conversely, the Sixers (or another suitor like the Celtics) now have to cope with the even realer possibility of Leonard leaving a good situation in the East to join up with James on the Lakers next summer. There are tons of factors to weigh with so many competing interests, and it will be interesting to see how it all unfolds. For the Sixers, this is obviously a fairly big blow to their offseason and will force them to take a long, hard look at the landscape in front of them. Having missed out on James and Paul George, they now have to weigh risks with very different downsides. Do they risk their chips on Leonard? Do they try to pry a lesser star away that's under contract, a la C.J. McCollum or Bradley Beal? Do they hoard their cap space for next offseason, the last time they will really have room to operate under the cap? The answers to those questions will become clearer over the upcoming days and weeks, and we will discuss the different options available to Philadelphia to complete their own rebuilding process. But if we're judging things by what Joel Embiid had to say over the weekend, perhaps the young Sixers aren't too concerned about who is or isn't coming. RELATED: Offseason a failure if Sixers don't land star player?